We’ve known for a while now that Nintendo is collaborating with Universal Studios to open Nintendo-themed areas in Universal’s parks in Orlando, Hollywood, and Osaka but now we’re finally getting details on the first park that’ll open. As you’d expect, the first Super Nintendo World will open in Osaka’s Universal Studios park in Japan, hopefully in time for the 2020 Tokyo Olympics. This feels like a long way away but timing the opening to match up with the Olympics is a good way of seizing on the large number of tourists that will be flocking to the country already. There’s a good chance those who had originally planned to visit Tokyo for the Olympics might be convinced to extend their stay and travel to Osaka to see the park before leaving. 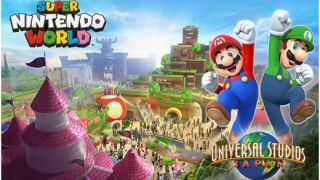 In an official announcement, Universal Studios Japan has revealed that Super Nintendo World will be made up of “expansive and multi-level environments” populated by state-of-the-art rides and interactive areas, as well as plenty of shops and restaurants all featuring and inspired by Nintendo’s most popular characters and games. From what we can see from the concept art for the park provided by Nintendo, things look like they’ll be fairly Mario-heavy. The image shows a Princess Peach castle with Peach and Toad characters interacting with park visitors outside, a Bowser castle looming in the distance, Mushroom-inspired buildings that hopefully don't house mushroom-heavy foods, and a multi-story building with a pipe entrance that looks like a Super Mario level. No doubt other characters will feature, too, since Nintendo has many popular IPs outside of Mario that will draw in visitors including The Legend of Zelda, Donkey Kong, and Pokémon. There aren’t any exact details surrounding the rides themselves or what the interactive areas will involve, but we hope there’s some form of Rainbow Road go-kart adventure that’s not been shown in the concept art out of mercy for our anticipation. The development cost for Super Nintendo World at Osaka is expected to exceed a massive 50 billion Yen. However, it’s clearly an investment worth making as Katushiro Miyamoto, Professor Emeritus of Kansai University, estimates that it will bring in approximately 6.2 trillion Yen for the Kasai region alone and 11.7 trillion Yen for Japan as a whole. Universal expect the park will create approximately 1.1 million jobs in Japan within a decade of opening. It’s not certain when the other Super Nintendo World parks in Orlando and Hollywood are planned to open, but hopefully we won’t have too long to wait after the Osaka opening.